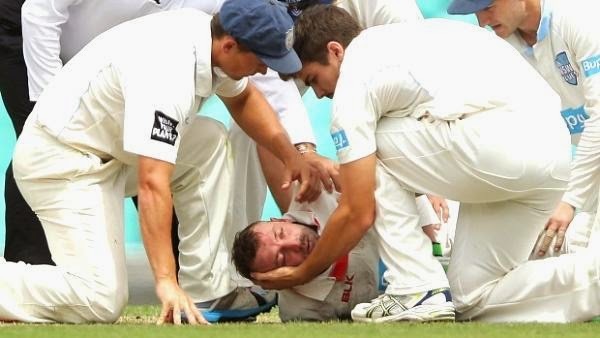 Australian opener, Phil Hughes, was hospitalized and is said to be in critical condition in the wake of being hit on his head by a Sean Abbott bouncer. The occurrence happened in a Sheffield Shield game played between New South Wales and South Australia. Hughes felt the full compel of Abbott's bouncer after he missed an endeavored snare shot, and drooped to the ground confront first even as players hurried to look in on him. He must be stretchered off the field and was taken to St. Vincent's Hospital by emergency vehicle. Play at Sydney Cricket Ground (SCG) was relinquished for the day as three ambulances and a medvac helicopter were hurried to go to Hughes. Therapeutic staff likewise performed a CPR the Australian. At the time of occurrence, Hughes was batting on 63. "The patient endured a discriminating harm and was transported to St Vincent's Hospital in a basic condition," an Ambulance NSW official told AFP. Cricket Australia said in a live match blog on its site that Hughes had "been leaving the short balls, had a go at this one, misconceived it and hit in the head. He passed out and fell gravely." Restorative staff chipped away at the 25-year-old, supposedly including mouth-to-mouth revival, for more than 30 prior minutes he was taken from the field in front of a helicopter arriving on the pitch. "Plainly the need is Phil's wellbeing and we need to keep his family completely educated. We don't have any redesigns on Phil's wellbeing right now," a Cricket NSW representative said. It has been accounted for that Hughes would experience a surgery at St. Vincent's in the wake of being put in an affected trance like state by the specialists.